I am so excited about this giveaway! If you have a shop, a blog, or anything online or in print, pay attention!!! 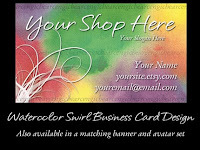 Vanessa from Bears Banners & Graphics is giving away a $20 gift card to her graphics shop! A winner will be picked on Friday, October 23rd. Vanessa designed my blog header and button, and was a pleasure to work with. Vanessa does Logos, Banners and Avatars, website and blog design, and even business cards and craft show banners! She has so many amazing pre-made designs in her Etsy Shop. Or, she is WONDERS at doing something CUSTOM just for you! Bring on the funk or the flying lady bugs were my favorite! Great work she does! I love the Gothic Scroll!! Gorgeous. I like the Asterik premade set! I like the groovy dots set in Vanessa's Shop, I tweeted the giveaway. I am also following both of your blogs! I love the custom made business card idea! Vanessa has already created my banner and avatar for my shop. She has ALSO created a physical 6 foot long banner to put up at arts/crafts fairs and Christmas bazaars. I've received tons of compliments on that banner! I love the Evening Lantern; its purple and it has lanterns! I was already following Vanessa's blog; my avatar is towards the beginning. I'm already a fan of DDL on facebook. So cool! I'm adding your button to my blog as we speak! She is so talented and I love reading her blog! I've been following her for a while and she's so sweet!